OMGOSH.... those are darling Sherrie! Arya's friend is certainly gonna love this! :) Have a great weekend! Sherrie ~ oh my these are so ADORABLE!!! LOVE how you did the little kitties!!! Those heart glasses are so darn ADORBS!! 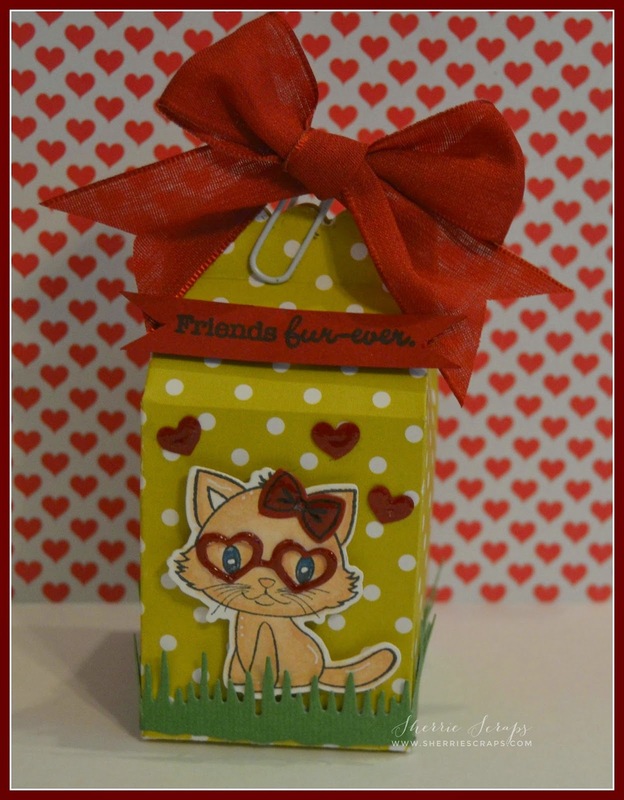 Then putting a whole scene on the milk carton die ~ SUPER CUUUTE!! I bet Arya's little friend just LOVED these! You seriously are the sweetest!! Have a wonderful weekend! 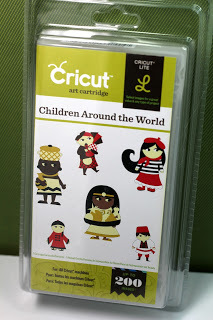 Adorable project, love those milk carton dies! Gorgeous papers colors you used on your projects! Love the kitties with their glasses! Have a great day! Gorgeous project. the milk carton dies are fantastic! So cute!! I so love their little glasses. :D Have a great weekend! They are just the cutest treat holders... great job Sherrie! Oh my gosh, they are both so absolutely adorable, Sherrie!! 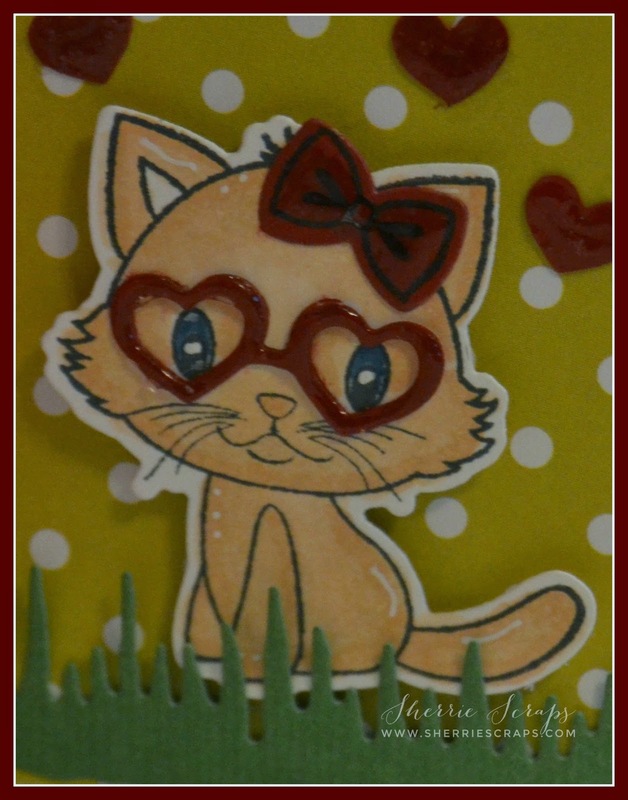 I love the sweet kitties with their heart-shaped glasses!! The hearts and grass are perfect touches!! What fun treats these are!! Arya's friend will adore it!! Sooooooo adorable! LOVING the kitties!!!!!!!!!!!! Such sweet kitties! I just love the gorgeous bows!Absolutely ADORABLE!! They will love it! I DO!! These are so super ADORABLE Sherrie!!!!! LOVE how you added the paper clip and gorgeous bow to the top! Super CUTE kitties and you colored them so beautifully! These are just too cute. Love the glasses you placed on your kitties. 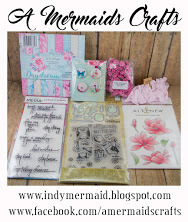 Thanks for joining us over on http://anyaoddiesandothers.blogspot.com. Super sweet treat boxes......love the adorable image and the Big Bow, Perfect! Oh how adorable! I have both of these sets as well and they are the cutest to work with! 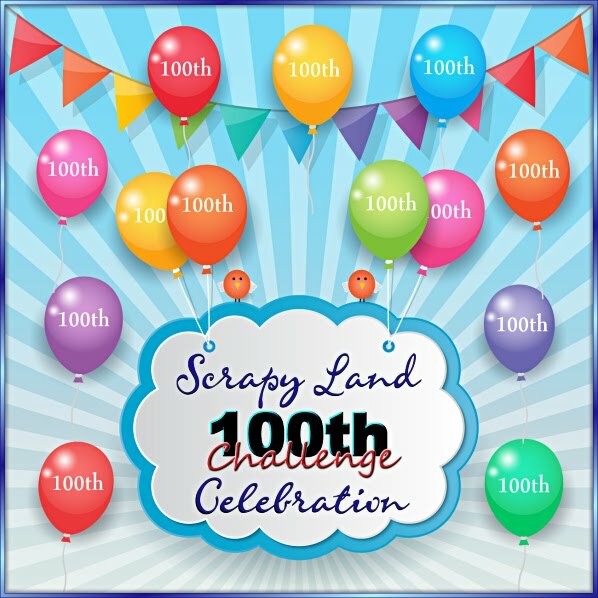 I sure hope it puts a huge smile on Arya's face and her friend's!! 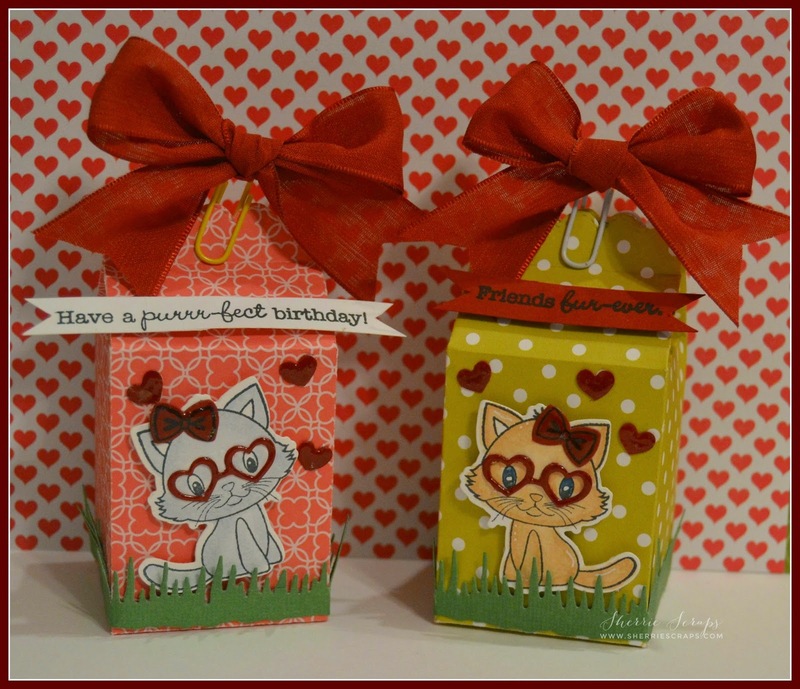 Enjoy the weekend and thank you for linking these cute treat boxes up in our Special Birthday FFC! Awe, these are such darling little treat boxes Sherrie! So so cute! Both are too cute. Love the papers and really love those adorable kittens with their adorable glasses. What fun and cute treat boxes. These are so, so CUTE!! Love the red heart-frames on the glasses! I'm sure Arya's little friend was delighted with her sweet gift boxes. Super cute Sherrie! The little kitties decked out in their sunglasses look darling! Oh Sherrie, these are so super cute!! I love those little glasses! So fun!! I hope you've been good, looks like you've been having a great time with the babies :) they are so beautiful!! I love seeing the pics. What adorable little milk boxes!! Those kitties with the glasses are just too cute for words. Love these precious little treats, Sherrie! Oh my, my, my - what sweet little kitties! 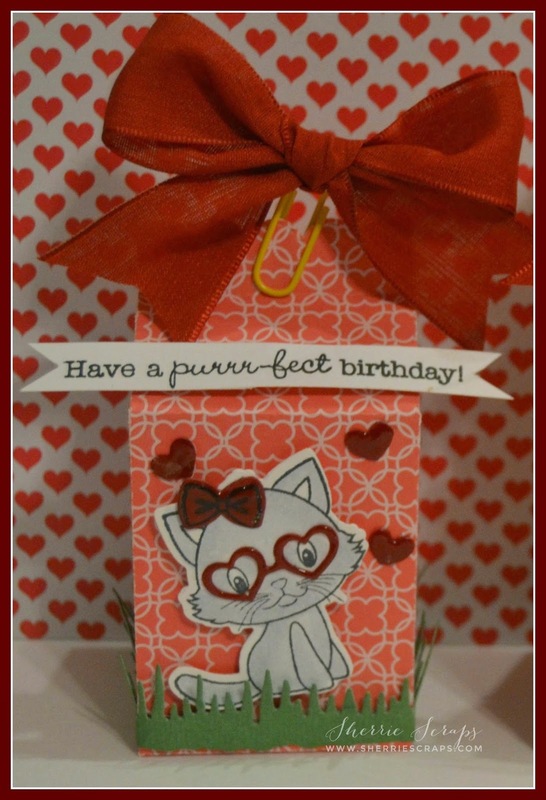 I am totally loving the heart shaped glasses and purr-fect sentiments. What fun treat boxes and such a special gift for a special little girl! 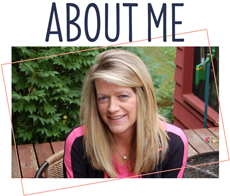 Adorable projects Sherrie:) Thank you for joining us over at Decorate to Celebrate.